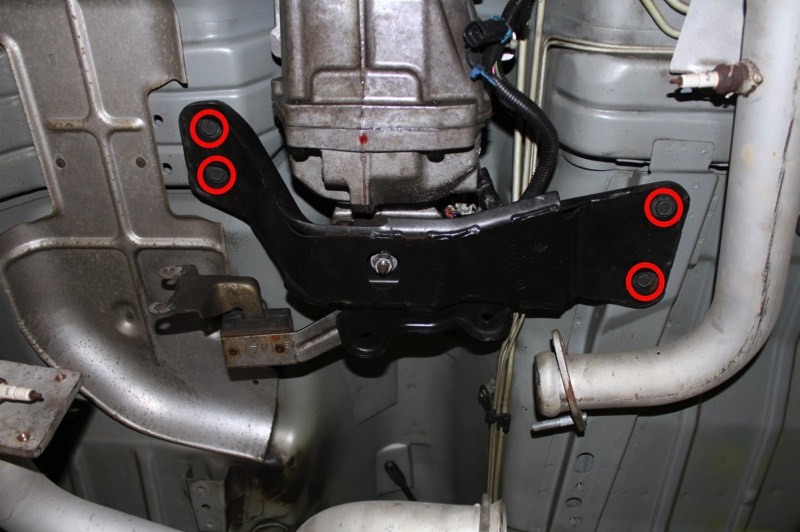 Before removing a single bolt from the transmission, there are several wire connectors that need to be disconnected. Please view the two images to the right and disconnect all wire harnesses, be sure the vent tube is clear, and don't forget to disconnect the clutch actuator cylinder (slave cylinder). Once this is complete, you can start turning wrenches. This car has the rear O2 sensors deleted so they were not in the way. If you still have your rear O2 sensors, be sure you disconnect those as well. 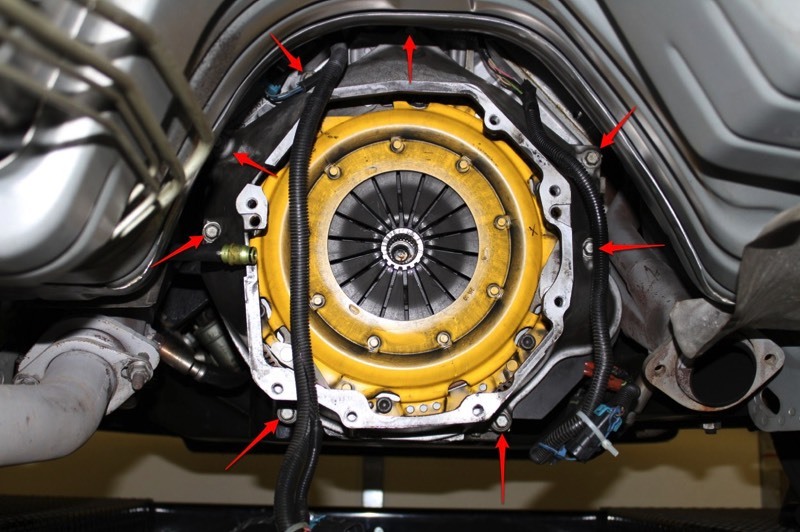 Shown right, the driver side of the T56 transmission. 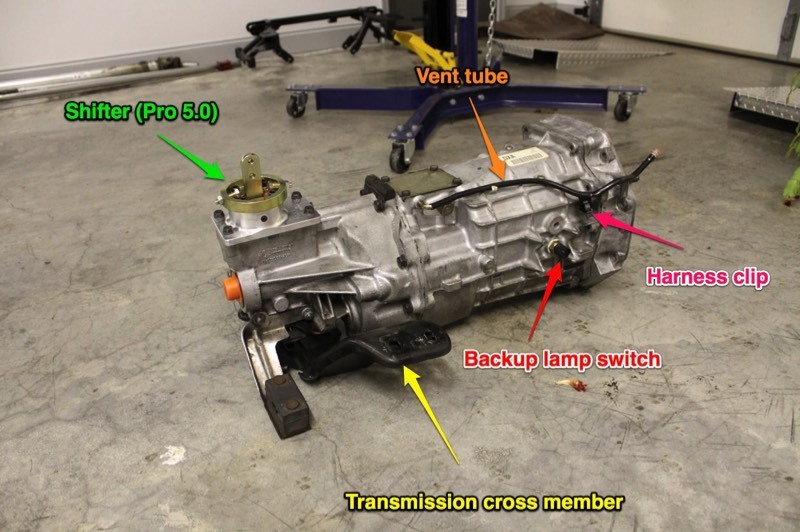 Shown right, the passenger side of the T56 transmission. 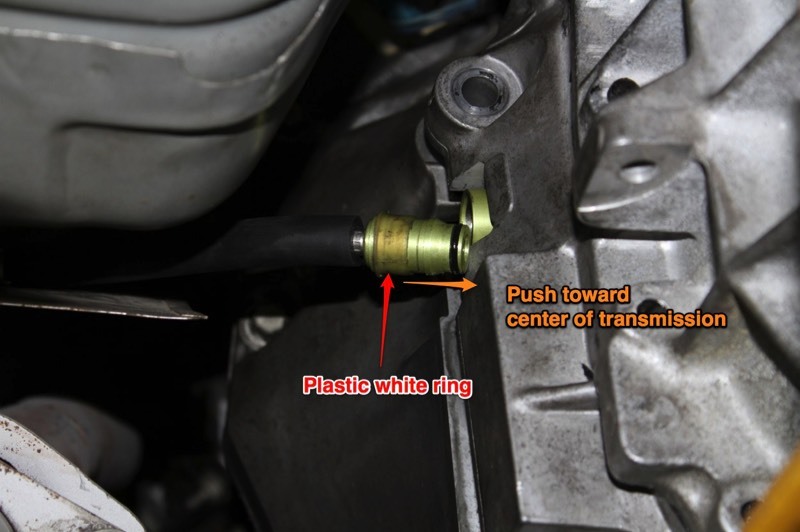 Disconnect the clutch actuator cylinder by pressing inward on the whitish plastic ring. 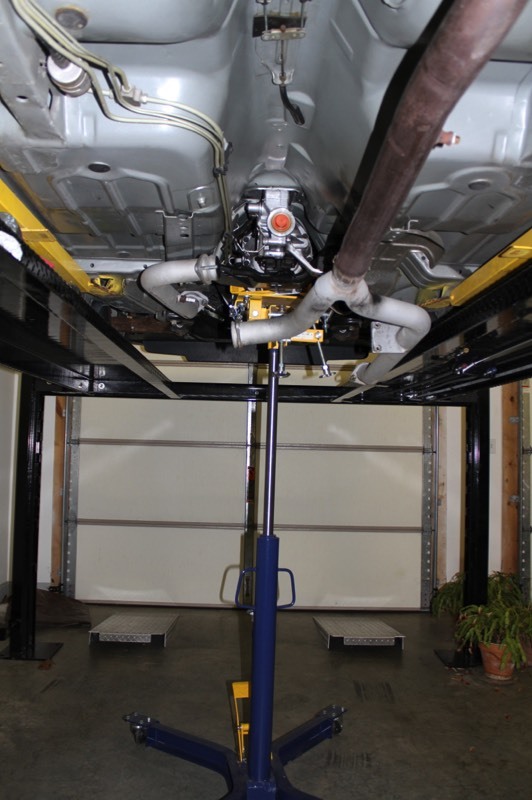 Place a transmission jack stand underneath the jack. Raise the jack so that it just touches the transmission. Secure the transmission to the jack so under no circumstances the transmission cannot fall off of the jack stand. Eight 13 mm transmission bolts need to be removed that connect the transmission to the bell housing. The pictures to the right show some of those bolts. Also included is a bell housing after being removed showing the location of the eight bolts between the transmission and bell housing. 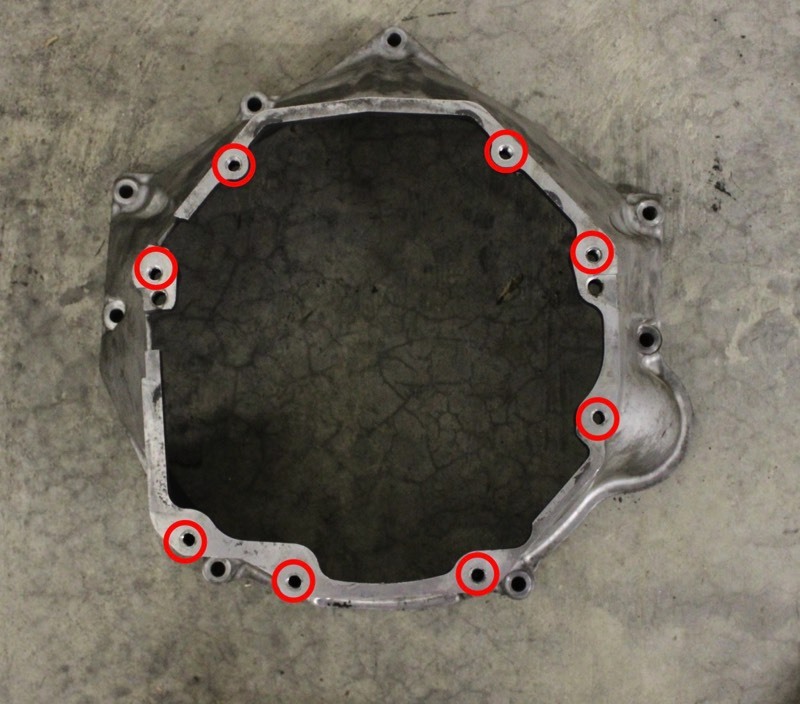 Remove the four 15 mm bolts on the transmission cross member. 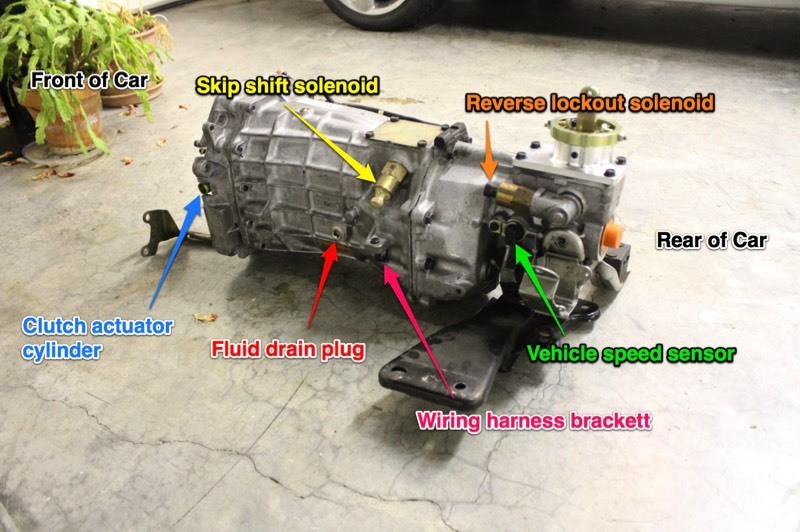 The transmission will be unsupported and will want to sag towards the rear of the car. Be careful. Remove the eight 13 mm bolts connecting the transmission to the bell housing.